Concrete is highly porous, which means it can stain easily. 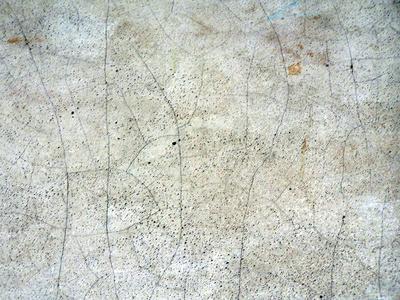 If left untreated, most stains can move deeper into the concrete, making them more difficult to clean. However, if you identify the stains, act quickly, then use the proper cleaning solution, most stains can be removed. Surprisingly, several common household items are effective stain removers. If you have just spilled a container of oil on your concrete floor, do not wipe it up. You'll only succeed in pushing it deeper into the concrete. Instead, grab some cat litter and pour it liberally over the stain, and wait 24 hours. Let the stain soak up into the cat litter so you can just sweep the mess away. If there's any remaining stain, use some scouring powder and scrub it off. If the stain is older, try using a grease cutting liquid dish cleaner mixed with water. Spread it all over the stain as well as the surrounding areas, and then scrub thoroughly. Make sure you build up a rich lather of soap suds. Be aware that a wire brush can damage the concrete, so use a heavy duty scrub brush instead. Rinse thoroughly when you have finished. If gum has hardened on the concrete, freeze it by applying ice, then scraping it off. If there's still some left, use some denatured alcohol. Pour it on the stain, and then rinse it off. A mild soap and water solution is usually effective in removing simple soil from concrete, though a little scrubbing might be necessary. When you're using water on the concrete, it's most effective to use a gentle mist-like spray. If the water pressure is too hard, it can push the stain down into the concrete. Scrape as much of the grease away as you can, then scrub the remaining stain with scouring powder.